10 plus 2/Intermediate Examination pass in Science with Physics, Chemistry, Maths and English with Minimum 50% marks in aggregate and 40% marks in each subject. 10 plus 2/Intermediate pass in Science with Physics, Chemistry, Biology and English with minimum 50% marks in aggregate and Minimum 40% marks in each subject. (ii) No stipulation in aggregate percentage but should have scored minimum 33% in each subject. 10th Class Pass. 10 plus 2/ Intermediate Exam pass in any stream (Arts, Commerce, Science) with 60% marks in aggregate and minimum 50% marks in each subject. Securing 50% marks in English and Maths/ Accounts/ Book Keeping in class 12th is mandatoryவயது வரம்பு :1. Soldier Technical: 17 years 06 months to 23 years. 2. Soldier Technical (Aviation/Ammunition Examiner): 17 years 06 months to 23 years. 3. Soldier Clerk/ Soldier Store Keeper Technical: 17 years 06 months to 23 years. 4. Soldier Nursing Assistant: 17 years 06 months to 23 years. 5. Soldier General Duty: 17 years 06 months to 21 years. Click the FACEBOOK ICON below To get Alerts of All Job Notifications from WAY2TNPSC Interested and Eligible Candidates can apply before 18-May-19. Keep on reading this page to know all the above details. So, it will be helpful to know the procedure and details for the candidates who wish to apply for this particular vacancies. Age Limit :1. Soldier Technical: 17 years 06 months to 23 years. 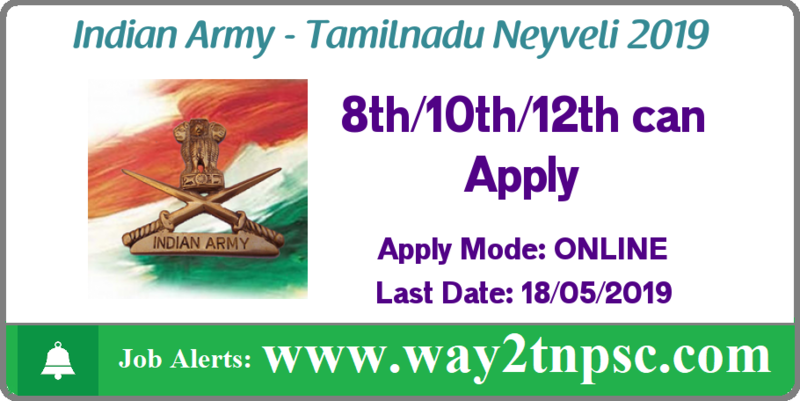 The above Notification ( Indian Army Tamilnadu Neyveli Selection Rally 2019 | Apply online ) briefly describes about the details of latest announcement or notification includes important dates like release date , last date of application submission, details regarding fees, exam timings. Candidates, check all the needs and apply accordingly.